Kenyon Pups...the Pop Up Potholder System. Cooking on the go just got easier ! Kenyon PUPS keeps pots safe and secure using a very innovative, patented design. Simply press the soft bumper down, then release and a post "pops" up 15mm to hold pot securely in place. When you have finished cooking (and the cooking surface has cooled), just depress the PUPS and it will lock in the down position. 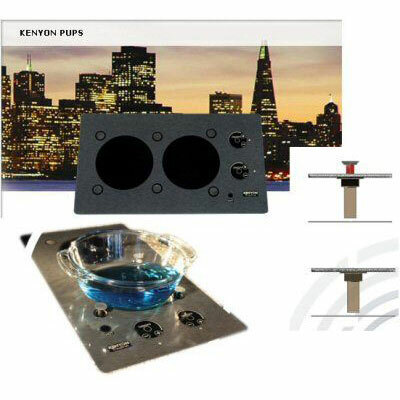 With the Kenyon PUPS system, you will gain valuable countertop space and reduce the cost of installation and materials. Dimensions: 21" x 12" x 3-1/4"
Model B40579PUPS: Portrait mount - 120 volt - 20 amp. Model B40580PUPS: Portrait mount - 240 volt -10 amp. Model B40581PUPS: Landscape mount - 120 volt -20 amp. Model B40582PUPS: Landscape mount - 240 volt - 10 amp.